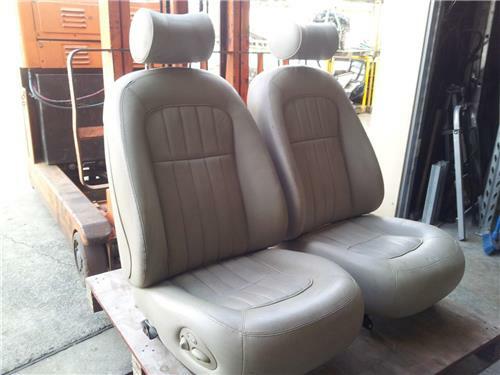 Up for Sale is a JAGUAR X300 XJ6 1996 original Leather seats inexcellent condition finished in Oatmeal colour. This interior would have to be one of the BEST original low kilometer sets we have seen in many years. The car was a beatiful X300 XJ6 & unfortunately was written off by the Insurance company. The seats are in excellent condition & have not been touched up by repair or paint (see photos still showing the grain of the leather). There is one small split in the Drivers seat located on the top left corner. It is about 20mm long & can be glued back together. The seats are not supplied with the module & you need to swap this over from your original seats (we will show you how - it is one screw & 2 plugs). This kit will enhance any X300 XJ6 or XJ12 Sedans & will fit all models from the early 1994 to 1997. They are not dryed out or warped on the piping as a lot of X300's end up with our harsh climate. It is complete with front & back leather seats. They can aslo be fitted to a earlier model Jaguar such as a Mk2 with some modifications & look great. A very cheap alternative to having a Motor Trimmer repair & replace your existing trim, as this would normally cost approx $3500 to $4000. Even after paying this much you wouldnt have the originallity of this set. We can help with delivery but would need to know your location & postcode to be able to quote. Buyer to contact me within 24 hours and must place a 10% deposit to secure. I reserve the right to relist or offer a next chance to the next highest bidder if a deposit is not received or other arrangements are not made.